Since planting up my pots, I have wanted to give them a layer of mulch to help prevent water loss. I knew I did not want to use the big, chunky cedar mulch I had used in my flower beds, and I had a vague recollection of seeing a small, almost pebbly-looking, mulch. This is what I wanted to use in my pots. Yesterday, I stopped at the nursery on the way home from work. Yes, I did buy more plants - details will be forthcoming. As I was checking out, I saw they had a display with small samples of different mulches. I found just the mulch I was looking for - small pieces and a really pretty dark brown, called "Cocoa Mulch". It was a little pricey - about twice as much as cedar mulch ($8.99 I think), but it was exactly what I wanted, and I only needed one bag (2 cu. ft.). When I got home and opened the trunk, it smelled delicious - like chocolate. I thought this was strange, as I did not have any chocolate in the trunk. But as I was unloading the mulch, I realized where the smell was coming from. I also realized that the "Cocoa" did not just refer to the color of the mulch, but to the source material. Trust me, I felt like a complete idiot for not realizing this sooner. If you are not familiar with this mulch, it is actually made from the dried husks of cocoa beans. These husks are the by-product of producing chocolate. They smell like chocolate cookies, or cocoa puffs, or a chocolate poptart. An entirely pleasant smell, though not one usually associated with a garden. Apparently this mulch has wide usage amongst rose gardeners. I really do like the look of the mulch. Here are some of my potted herbs all mulched up. 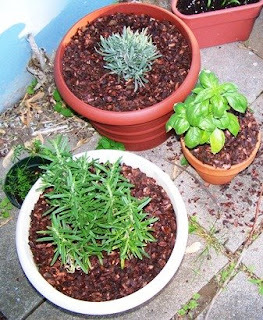 (Clockwise from top: Lavender, Basil, Rosemary, and in the small black pot - Lady's Bedstraw). 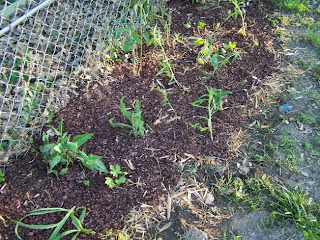 Since I had lots extra after mulching my pots, I also used it on my prairie patch, which was only lightly mulched in the first place. I am not sure how I feel about the scent - it does smell wonderful, but it makes me hungry for chocolate and it seems out of place. I did read somewhere that the scent fades after 2 or 3 weeks. A WARNING: since this mulch is produced from the cocoa plant, it does have the same chemicals that are toxic to dogs as chocolate has. Thus, use with caution if you have dogs. Earlier this spring, I dug up two beds for planting flowers and vegetables in. At that time, the soil seemed nice and I did not think to mulch the beds. Well, not only did the soil become really hard on top, but more weeds were popping up than the seeds I planted. Of course mulching would have helped with both problems, and I knew this somewhere in my brain, but still I did not mulch. Even though one chapter in my dissertation dealt with how soil disturbances (i.e. bare ground) encourages the germination of weed seeds, I did not mulch. So I definitely had the "book" knowledge to know that mulching would be beneficial. It was not until I experienced what happened without mulching that it all came together. For me, this has been a lesson in how people learn - hand's on experience is a good thing! Now, I just need to keep it in mind as I am teaching next year. 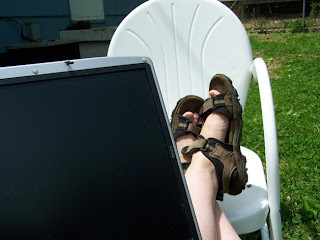 It is summer, and I can work from home and enjoy the wonderful weather. This is one thing that makes all the hard work of earning my PhD worth it. This summer, I am in vacation mode!